Make a greeting card to celebrate the season. 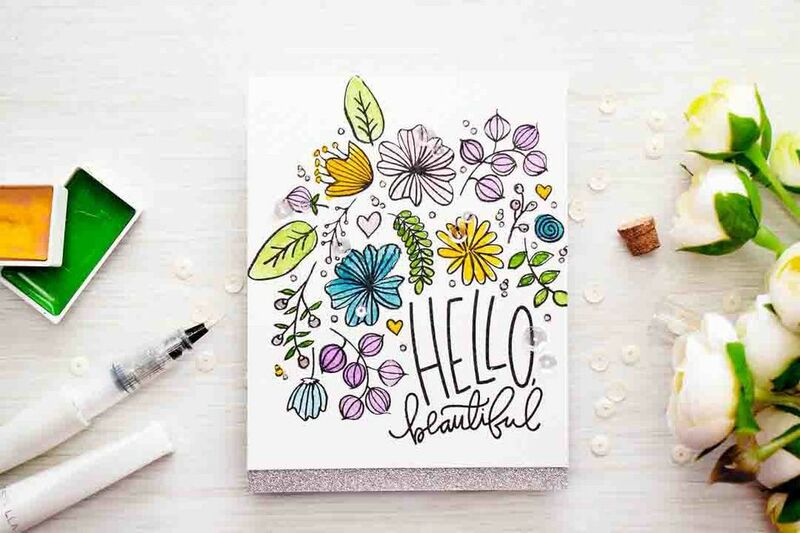 Yana Smakula a Ukranian born designer shares instructions to make this aboslutely delightful card. The card is made from stamps and then is filled in with watercolors. Simply beautiful! Make one for someone special just to let them know how much you care. Welcome spring with this lovely paper wreath adorning your front door. The wreath will make you smile every time you enter your home! Are you the type of person that loves bold colors and beautiful designs that stand out from the crowd? This bohemian floral wreath will be for you! Lia Griffith is offering templates so that you can make one just like it for your home. Your inner artist will love it! Floral crowns have been fashion accessories since the time of the ancient Greeks. Today women and girls like to wear them as wedding and party head adornments. The great thing about crepe paper floral crown is that they look beautiful and last forever unlike their fresh counterparts. Nothing says spring more than starting your garden. Make a wreath from a garden hose. Jill, the author of the tutorial, will guide you step by step with this no fail craft project. Get ready to stand back and receive compliments from your friends when they come to visit you! This plastic spoon craft is perfect for preschool aged children. Cut out some flowers from glittered paper, make a hole for a spoon and use a marker to draw on a face.It is so simple to produce. Your little ones are sure to love this project! These sewn paper bunnies are just the cutest! Make some for Easter this year and fill them with a candy surprise. They are sure to be a hit with children and adults alike! Tulips are a symbol of spring. Make a beautiful paper tulip bouquet to decorate you home. This project would even be suitable for a Mothers day craft project for younger children. The flowers are quite lovely and very easy to make. Spring is the time of birth and new life. Make a birds nest filled with baby birds from paper and cotton balls. This craft could be used as a teaching aid to talk about fresh starts and renewal with your children. Your table will look so lovely and colourful with these paper flower decorations. Your children will have fun creating them and will be proud when each place setting at the dinner table has paper flower decor made with their own hands. These paper peonies are so beautiful you could almost think they are real! The flowers are made of crepe paper and take virtually no time to construct. Add some paper sunshine to your home decor today! Curly Willow adds beauty, elegance and drama to any floral design. Just place the curly willow into a vase and glue some tiny paper birds and buds to the stem. Instant spring home decor! Aren't these paper plate bunnies the cutest ever? Gather your children and make these decorations to celebrate Easter or spring. A good time will be had by all! Everyone loves live houseplants in their homes. Protect your furniture from dirt and water damage by making decoupaged plant stands. Mod Podge Rocks will show you how in this easy to follow tutorial. Are you hosting a spring bridal or baby shower and are looking for party decorations? These paper daffodils in a teacup would be lovely! Make one for each guest to take home as a party favour. Hop into spring with a brown bunny paper craft!This bunny is a 3d printable. Print out the parts on your computer, cut and glue together. Voila, you now have a 3d rabbit. Make to sure to check out all of the other free printables that Cannon offers for free download on their site. The animal printables are amazing! Make a mini accordion scrapbook to save your precious memories. This book holds Instagram-sized pictures. Why not make a spring themed book? Use pastel colour paper and embellishments to represent spring. These paper flower cake toppers are perfect for Mothers day, spring bridal and baby showers. Watch your cake transform from ordinary to extraordinary with this flower craft party decoration. When you see daffodils blooming you know, winter is over, and spring is here. The only problem is that these flowers have a very short blooming season. Make daffodils from crepe paper, and you will enjoy them for a long, long time! Take your coloured Easter eggs one level higher and decoupage them. You can use real or plastic eggs. It doesn't matter. Cut some origami paper into triangular shapes and glue onto your coloured eggs. These eggs look stunning when finished. Tulips are one of the first flowers to bloom each spring, so ring in the season with this everlasting paper tulip arrangement. Choose your favorite colors and get crafting! This paper flower crown is just stunning! It is hard to believe that it is made from plain construction paper. An elementary school teacher devised this craft as a way to keep her kids busy during story time. She says if elementary aged kids can construct these beautiful crowns anyone can! Make some butterfly corner bookmarks for yourself and for your friends that love to read. A wonderful video is included with the tutorial so you can't fail. These corner bookmarks make a lovely mothers day present for those moms that love to read. These paper birds on branches are a sign that spring cannot be far away. Place some on your windowsill for a cheerful reminder that warmer days are ahead. This paper tube craft doubles as a Valentine Day Craft! Pretty hearts become mice ears and noses. so cute!